Everyone’s favorite No. 1 blue engine and the island of Sodor came to life on Friday, July 27 with the grand opening of Thomas Town at Kennywood Park. Thomas Town is now open at Kennywood Park! Thomas Town features five rides, including a train ride with Thomas, a live stage show, themed play and entertainment areas, a retail store and more. 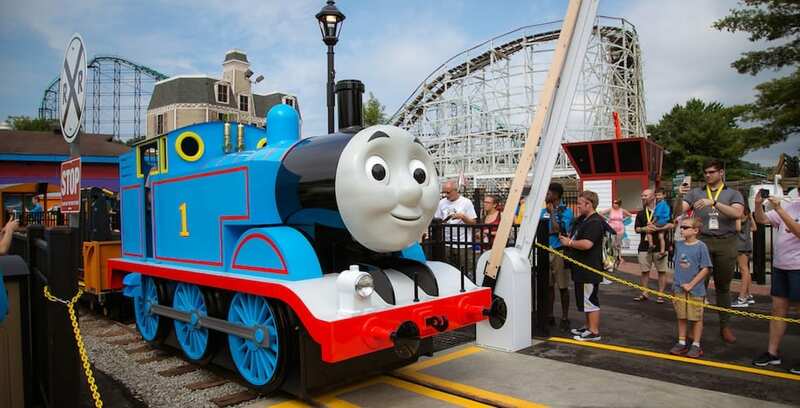 The opening of Thomas Town marks the second-largest permanent Thomas & Friends attraction in North America. The ribbon has been cut for Thomas Town at Kennywood Park! Photo courtesy of Brenda Washington O’Neale. Thomas Town is one of the largest single-year additions in Kennywood’s 120-year history, adding five new family rides and retheming the former Kennywood Railroad into the famous No. 1 engine. The area also includes an indoor play zone for kids, a Birthday Room, a retail store with a selection of ‘Pick Your Own Minis’ custom collection, and a live stage show featuring Sir Topham Hatt, Percy, James, Emily, and Gordon. 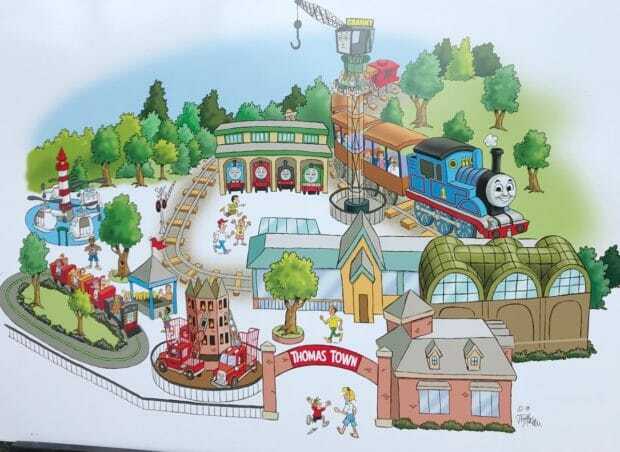 All of the new Thomas-themed attractions are located in and around the existing footprint of Kennywood’s train ride, which has been in operation since 1945. “With 120 years of history, Kennywood is one of the most beloved amusement parks in the country and we are so excited to bring out latest Thomas & Friends attraction to Pittsburgh for families to enjoy for many years to come,” said Julie Freeland, senior director of global live events and attractions for Mattel. A map that features the layout of Thomas Town. Photo courtesy of Brenda Washington O’Neale. Guests will be able to visit familiar destinations from the Island of Sodor like Knapford Station and Tidmouth Sheds. Sir Topham Hatt, controller of the railway, will be on site for meet-and-greets and to take photos with guests. Journey with Thomas: Head to Kennywood Station for an unforgettable Journey with the No. 1 blue engine! Guest of all ages can hop aboard a train ride with Thomas and enjoy views of the Monongahela River and Edgar Thomson Steel Works, the oldest steel mill in the Steel City. Cranky’s Drop Tower: Strap in, as Sodor’s strongest crane will lift you high above Thomas Town, and then drop you down! Harold’s Helicopter Tour: Kids can get inside their own Harold Helicopter and pilot him up and down as they spin around and around. Flynn’s Fire Training: Junior firefighters can shoot water to extinguish flames on this unique, interactive ride with Flynn. Diesel Drivers: Don’t forget the Diesels! Climb aboard Diesel, Iron Bert and other Diesel engines for a fun ride. A look at the stage show in Thomas Town. Photo courtesy of Brenda Washington O’Neale. Steel City Adventures live show at Tidmouth Sheds: Join Percy, James, Emily, Gordon, and Sir Topham Hatt for a show full of songs and stories as they prepare for an important journey to Pittsburgh! 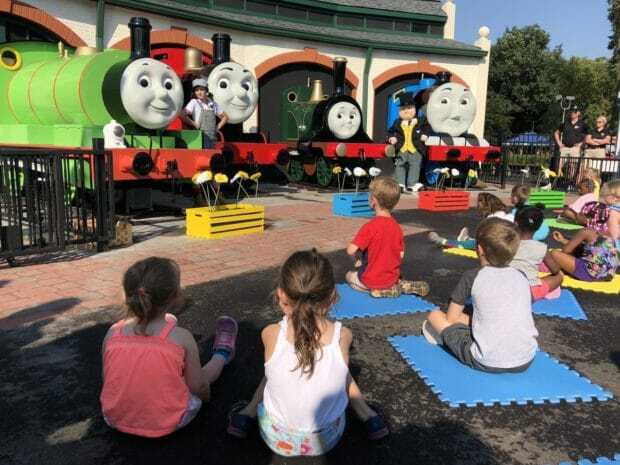 For a limited time, guests are also able to watch the 4D film, “Thomas & Friends: Bubbling Boilers” at the Kennywood 4D theater to celebrate the opening of the new land. To learn more about Thomas Town, and to purchase tickets, visit Kennywood.com.